We as future doctors, can’t afford to be “okay” with mistakes! Mistakes determine everything in our life and especially on the MCAT. It’s not only the amount of right answers you get on the MCAT that contribute to your score, but it’s also the amount of mistakes you make that determine your score as well! Making a mistake as a practicing medical professional can cost you everything! However, as we’ll cover later in this post, mistakes (during the practice phase) can also be the REASON you succeed. How? If you know how to use them to your advantage. We’ll cover more about how to do use them to your advantage later in this post. Truth is, every small, silly, and stupid mistake on the MCAT adds up. Yet those are the mistakes that play one of the biggest roles in differentiating the top MCAT scorers from the average-scoring MCAT writers. We’re talking about mistakes like seeing after the fact that it said ‘pKa’ not ‘Ka’, or not keeping track of units like mm, cm, kohms. Some people might get every extremely hard question wrong but make no stupid mistakes and still master the MCAT. Some people might get all the hard questions right but make a lot of stupid mistakes and not master the MCAT. Your aim, obviously and ideally, is to be the 90th percentile scorer who doesn’t make any stupid mistakes and also gets the hard questions right. Most of the time, students are making the same mistakes as everyone else. If you know about them, you’re less likely to do them yourself. A lot of our silly mistakes are a result of our nerves, our stressed mind, and our lack of awareness. I mean you can’t blame us – especially when you’re writing an exam that determines your future! But if you can figure out how to de-stress, stay calm, and raise your awareness during the MCAT, imagine how much of an advantage you can gain from every other student writing the MCAT with you who is bound to be making stupid mistakes. Resulting in silly mistakes that could have easily been avoided. Next, let’s talk about practice questions. When you make a mistake on MCAT practice questions, what do you do next? What thoughts go through your head? First, what is mistake analysis, exactly? Mistake analysis is one of the most underrated MCAT study strategies. It is just as important as content review and doing practice passages. Even intelligent students often underestimate it. For some reason, most students pass over mistakes and write them off as “stupid” or “careless” and then move on. Every MCAT Master performs mistake analysis regularly to discover areas where they need to give more attention and other areas that simply just need some review. Mistake analysis allows you to develop a strategy to not make the same mistake again. For example, let’s say you get a question asking you to rank strengths of acid in order. Some people tend to quickly glance through 10 acids, thinking it’s so easy, and end up screwing up because they missed the middle acids that change everything. So once you realize you keep making similar mistakes, one solution to could be to always mark questions like this, and when the page is done, go back to it and double-check. Perhaps you want to do that with all questions that you habitually get wrong. A lot of times, you have to catch what your brain is doing on autopilot and stop it. Remember, every single mistake is an opportunity to eliminate your weakness. Most fail to recognize this important fact and their score stagnates because they don’t learn how to improve it. Most people realize this fact the second time they write the exam. You don’t want to be that person! You want this to be the last time you ever write the MCAT. Learn this stuff now, so you don’t have to go through this grueling MCAT prep process again! In mistake analysis, the goal is to analyze the score reports you get through MCAT prep and try to gain as many insights as you can on your performance. The key is to memorize fewer details and keep an eye out for trends in data instead. 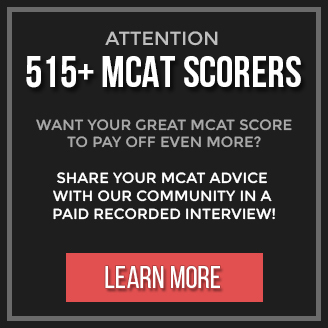 If you’re interested, we took all our months of research that we spent gathering the study strategies of top MCAT scorers and MCAT experts, and put them all in one ultimate guide. In this PDF guide that you can download and read through in a day, we have an entire section called ‘The Art of Strategic MCAT Practice’ where we cover mistake analysis and much more in greater detail. Plus, you’ll find all sorts of MCAT study and testing techniques, shortcuts, templates, frameworks, and hacks in the guide that if put into practice, can lead to a substantial score increase (an increase of 10 points or more isn’t uncommon). You can download or learn more about the guide by clicking here. If you spend some time learning our best MCAT study hacks, you can be sure a great MCAT score is yours for the taking.